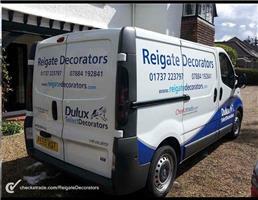 Reigate Decorators - Painter/Decorator based in Reigate, Surrey. We are a small, friendly painting & decorating company based in Reigate with both male and female decorators. Our main work is the redecoration of private homes in and around the Reigate area. Reigate Decorators stand for reliability, professionalism and honesty, and are proud to be working in partnership with Checkatrade, and also approved by Surrey Trading Standards. If you need just one small room redecorated, or your entire home, we offer a complete decorating service at competitive prices. With our experienced male and female decorators, and excellent team management, along with the peace of mind that we come highly recommended by CHECKATRADE, rest assured that you will receive an excellent service along with value for money from start to finish. Primary Work Undertaken - Interior painting and decorating. Wall and Lining paper hanging. Both oil and water based paints for allergy and asthma sufferers. Secondary Work Undertaken - Small exterior work only. We no longer work from ladders or scaffolding.